We are keen horselovers and showjumpers and keep 6 horses at Camelot. 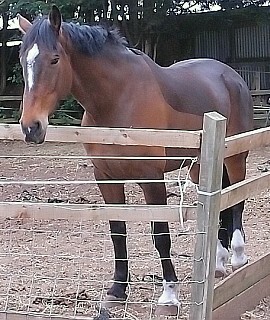 Pictured is Nelson who is possibly the worlds friendliest horse. He is always in the small paddock adjacent to the car park and is our 'meeter and greeter'. He already has his own fan club. He particularly loves children, his favourite colour is green and his favourite foods are polo's and carrots! There are a range of horse feeds available including Dengie, Dodson and Horrell, Spillers, Allen and Page, Honeychop, RB and Bearts. 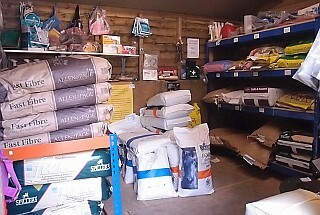 We also stock salt and vitamin licks, haynets, ropes, grooming equipment and vet supplies. A large range of supplements are available to order upon request. Below is a section from our equestrian range of feeds and accessories. Where possible we try to buy in on special deals, so the prices may differ from time to time, but these are the basic prices. Jump to: Horse Bedding | Horse Feeds | Horse Misc.